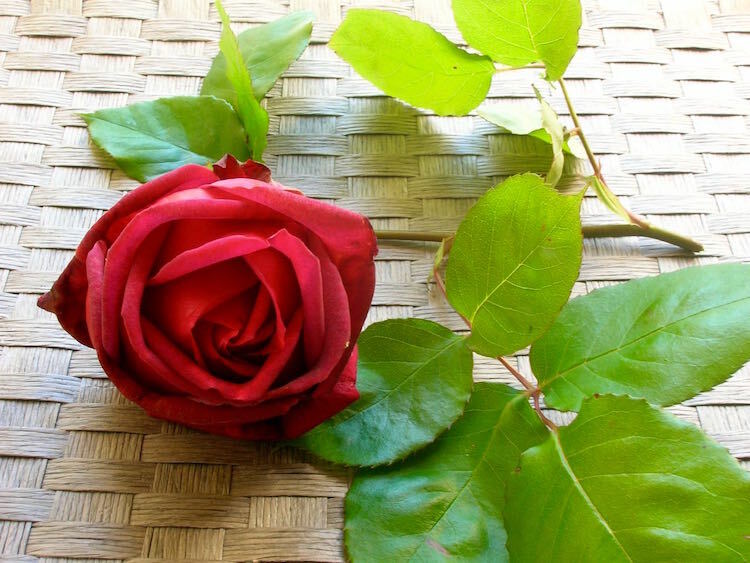 A few years ago as I was savouring the deep red colour and scent of the only rose we have in our garden, I was inspired to capture these qualities along with the flavour by doing something other than rose sugar, crystallised roses or pot pourri. I’d made elderlfower cordial and various other syrups any number of times, so why not try rose as a syrup? I’m so glad I did. It’s a great way to capture the very essence of rose and can be used in any number of ways: as a cordial, it makes a refreshing drink with both still and sparkling water; it’s a nice addition to cocktails and works fabulously well with fruit of all kinds but particularly summer berries. Try marinading strawberries in it. You can use it in preserves, baking or drizzled over ice-cream. Whipping up some dairy cream or cashew cream with a touch of rose syrup is one of the best things ever. There are plenty of recipes using the syrup to be found at the bottom of this post. How Much Rose Syrup To Make? I make rose syrup every year now. I have to adapt the quantities according to how many roses I get. This year my rose, which is not ideally placed and is in a shady corner, produced only one flower. The quantities given in the recipe below are for one large flower, but they can easily be scaled up if there are more roses available. Lucky you. The syrup keeps well in the fridge, but can also be frozen in plastic water bottles. A deliciously fragrant and colourful rose syrup that captures the spirit of summer and can be used in many ways. Place sugar and water in a pan and place over a low heat until the sugar is fully dissolved. Add the rose petals and leave uncovered to just about simmer for half an hour. Strain the syrup into a sterilised bottle, seal and leave to cool. This recipe can be scaled up according to how many roses you have and how much syrup you want to make. Can keep in the fridge for up to a year. Thanks for visiting Tin and Thyme. If you make this recipe for rose syrup, I’d love to hear about it in the comments below or via social media. Do share photos on your preferred social media site and use the hashtag #tinandthyme, so I can spot them. For more delicious and nutritious recipes, follow me on Twitter, Facebook, Instagram or Pinterest. This post may not be about shopping, although the sugar was bought at our local co-op, but the rose was sourced very locally indeed – from our garden. No food miles required. So, I’m hoping Elizabeth will be lenient and accept this rose syrup for Shop Local at Elizabeth’s Kitchen Diary. As roses are now in season, I’m also sending this rose syrup off to Ren Behan for Simple and in Season. wow…we use rose syrup in lot of desserts in India. Ooh, I bet you do. I’d be interested to know how you make it? What a wonderful idea, I’m so curious to try it on ice cream, sounds delish!! Thanks Andrea, let me know what you think if you do get to try it on ice-cream – or anything else. 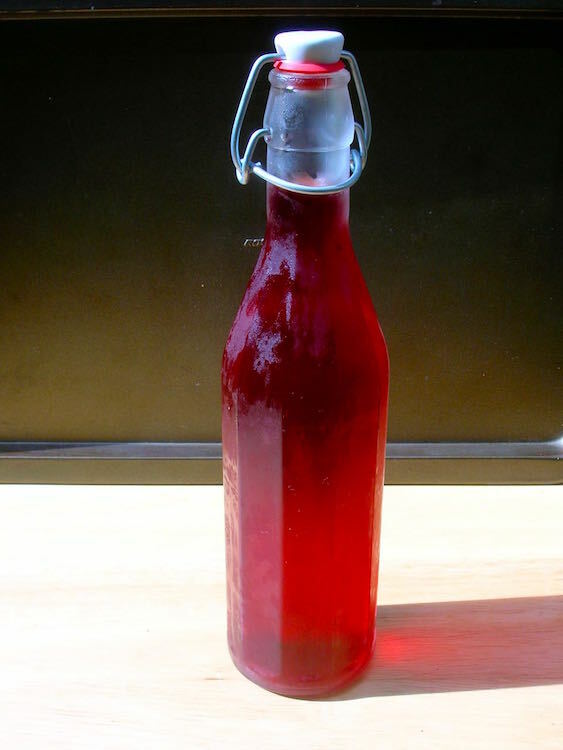 I have never tried making rose syrup…this is such a great idea. Angie, it is one of my favourite things to make and to have on hand – an exotic taste of summer. Good idea Helen, I’m sure someone will be happy to donate a rose – just make sure they haven’t been sprayed with anything horrid. I’ve never used it before. Well I did make my own as a wee girl with water and smooching the petals about, but there was probably still bugs and everything in there. I thought I was making perfume lol! My parents rose bushes didn’t stand a chance. Haha, sounds like it’s may be time for a 2nd attempt Jac. 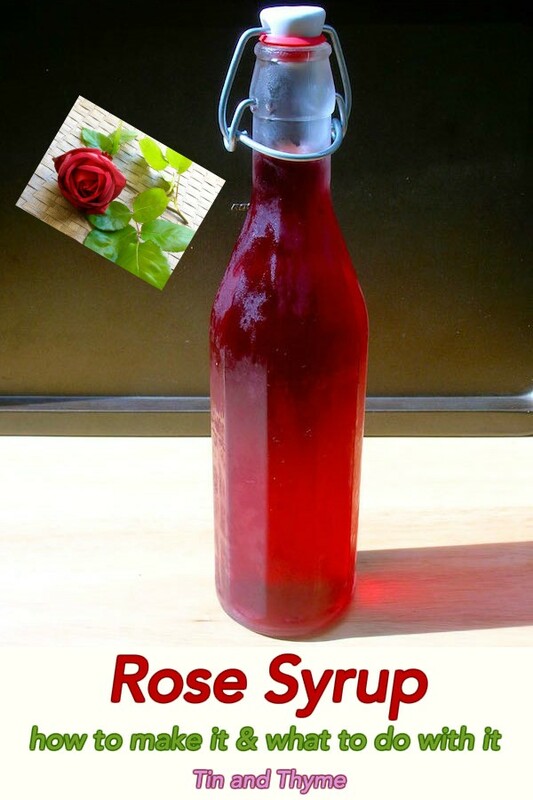 I love rose syrup and use it a lot but always buy it, I will book mark and try your recipe. Wow! this looks fabulous, especially all the ways that you could use it. Thanks Cheri, the possibilities are endless and just a little can add a subtle flavour to fruit which isn’t always obvious. Ooh that jam does sound good Galina. Rose and berries make for a fabulous combination. Rose syrup what a nice idea. I have never tried it and I love the idea. Your blog is getting better and better, I love your new photography and the design of your site. The minute I saw this recipe, I knew I had to do it. When we came home from shopping this morning our Scent-Imental striped rose has lost two blooms that were in a blowsy heap of perfect petals on the grass. I now have the most perfectly delicious syrup possible. Thank you! Ah brilliant, how lovely Jenny. Do you have a picture? Brilliant Jenny – so glad you like it and I love the two lots of rose petals. Just to let you know I’ve blogged about your recipe, you can see it here : http://jennyeatwellsrhubarbginger.blogspot.co.uk/2015/06/rose-syrup-oh-yes-its-thing.html Do let me know if you’d like anything changing! Oh do you really spray your roses GG? I guess that’s probably why mine never look as good as my grandfathers used to! I’ve never made rose syrup, sadly I don’t have a nice dark red rose, only pink ones. Love the look of it and I’m sure it will be featuring in recipes soon. If your roses are fragrant Janice, do give them a try. You’ll have a pretty pink syrup, and the flavour should be good. I love your presentation in those beautiful glasses! Thanks CC, although I’m a bit lost as to which glasses you are referring to. How beautiful. And how I envy you living in Cornwall. I will just have to cultivate my garden (as they say). Meanwhile, what a great little recipe – I wonder what other flowers it would work well with? Thanks Fiona. As you know, I love living in Cornwall and feel lucky to be back home again. As for the syrup, I’ve tried elderflower and lilac with good results, but rose is my favourite. This is a second comment because I can’t tell what has happened to the first. It looks lovely Choclette…and simple enough even for me. Now, I just need to find the rose! I’ve never tried rose syrup before. new project for me! love the idea oaf it drizzled over ice-cream. yum. It’s so easy Sarah, all you need to do is find a well scented unsprayed rose or two. I love love love rose syrup and have a tonne of ideas of what to do with it and now you have given me a tonne more. Hooray for roses, they have such a wonderful flavour. Oh my Choclette! Wonderful!! It has never even crossed my mind to make rose syrup…… I think the idea of soaking roses brings back memories of nasty childhood perfume experiments. Now this sounds far more appealing. I am wondering what other flowers could be used? I will definitely be giving it a go. Does it matter what type/colour of rose you use and is it better to have a strongly scented variety? Ah Kate you need to make this quickly and get rid of nasty experimental perfume recipes. You can use any scented rose, the more deeply perfumed the better. Colour is less of an issue, but if you can get dark red, you’ll get a better colour. Also make sure they are unsprayed. Thanks for the recipe. In singapore, we often buy rose syrup and mix it with water to drink like squash. I love it so much! Ah yes, I do that too Eileen. I’ve never seen it for sale over here. That is such a stunner of a rose, and what a super way to cook with it – beautiful! Look at that colour and I bet it smells divine!! Thank you for sharing with the #ShopLocalChallenge! This recipe sounds wonderful. I’m no gardener so am off to badger my ‘green-fingered’ friends for some unsprayed roses. Can’t wait for Summer!! It’s one of my favourite staples Mary. Just about to make some plum and rose ice lollies with it now. Hope you manage to find a good rose or two. Thanks Nam. Rose is the taste of summer for me and it goes so well with summer berries and other fruit.